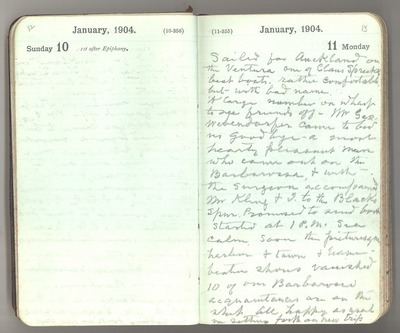 January 11, 1904. Sailed for Auckland on the Ventura, one of Claus Speckel’s best boats, rather comfortable but with a bad name. [There were] a large number of people on wharf to see friends off. Mr Geo. Webendorfer came to bid us goodbye – a most hearty pleasant man, who came out on the Barbarossa, and with the surgeon accompanied Mr Kling and I to the Black’s Spur. Promised to send book - started at 1:00pm. Sea calm, soon the picturesque harbour, and town and wave-beaten shores vanished. Ten of our Barbarossa acquaintances are on the sharf [ship]. All are happy as usual in setting forth on a new trip.